England's women were thrashed by India, who sealed a series victory with a seven-wicket win in the second one-day international in Mumbai. The tourists slumped to 44-4 and 95-7, only recovering to 161 through a last-wicket stand of 42 between Nat Sciver (85) and Alex Hartley. India were barely troubled in the chase, Smriti Mandhana's 63 helping them home with almost nine overs left. The third and final match in the series is on Thursday. With the chance of winning a first series in India gone, England can still earn valuable points in the International Cricket Council's Women's Championship. The opening two defeats have kept them in seventh place, with only the top four qualifying for the 2021 World Cup at the earliest opportunity. After 11 games, the 2017 world champions have won five and lost six. With series against Sri Lanka, West Indies and Pakistan to come, England's fate remains in their own hands, but another defeat in India would leave little room for manoeuvre. Captain Heather Knight told BBC Sport: "We haven't given a true account of ourselves, and that's disappointing. We haven't played well enough. "The series has gone now, but we have one more game with Championship points on offer. We have to move on and focus on the last ODI. "I don't think we have played anywhere near as we can as a team and that is frustrating. I guess it does put a little bit of pressure us in terms of the Championship and that is our own doing. We'll have to scrap hard to get those points." England were well placed for victory in the first one-day international, only for a collapse of 7-25 to give India a 66-run success. After winning the toss on Monday, Amy Jones, Sarah Taylor, Knight and Tammy Beaumont all perished to loose strokes. Sciver rebuilt in a stand of 49 with the recalled Lauren Winfield, but after Winfield holed out to deep mid-wicket, Shihka Pandey pinned both Georgia Elwiss and Katherine Brunt lbw to complete an excellent return of 4-18. 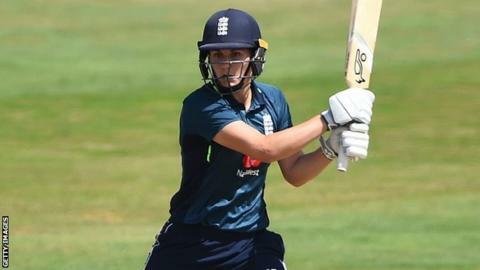 Sciver received little support from Anya Shrubsole and Sophie Ecclestone and, after surviving a tough chance to wicketkeeper Taniya Bhatia on 42, was on only 45 when number 11 Hartley arrived. Hartley was dismissed for the first time in international cricket in the first ODI, but made amends here by defending 17 balls as Sciver struck some meaty blows into the leg side. Their partnership of 42 is a new England record for the 10th wicket and was only ended when Sciver tried to sweep pace bowler Jhulan Goswami, the lbw decision giving the world's leading ODI wicket-taker her fourth scalp. If the Sciver-Hartley partnership revived England, their hopes were raised further by a brilliant catch by Jones, running back from point to dive and hold Jemimah Rodrigues off the bowling of Shrubsole. From 1-1, the hosts were steadied by the elegant Mandhana and Punam Raut. Bar Raut surviving a tough caught-and-bowled chance to Sciver, their progress in a stand of 75 was untroubled. They were parted by a piece of brilliance from England wicketkeeper Taylor, who pulled off one of her trademark leg-side stumpings when Raut overbalanced off the bowling of Elwiss. However, the door was closed again by home captain Mithali Raj, who supported Mandhana to her 15th ODI half-century, full of classical drives, lofts down the ground and powerful sweeps. And, even though Mandhana was lbw to Shrubsole, Raj inched India towards the target, eventually clipping Elwiss to the mid-wicket boundary to end unbeaten on 47.